Removing the silk makes the corn easier to eat, while soaking the ears keeps the husks from burning the instant they hit the grill. Leftover corn can be cut off the cob and added to quesadillas, salsas, and salads. Pull the husk down from each ear of corn, leaving the leaves attached. Remove the corn silk, then reposition the husks. Tie each ear with a strip of husk or twist the top of each husk to secure. 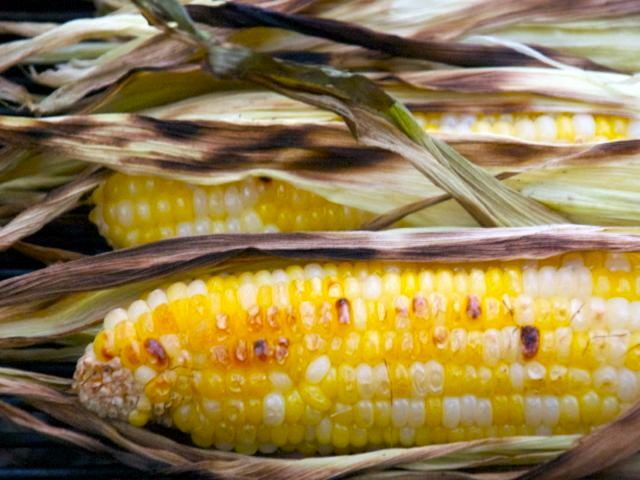 Fill a large pot with water, and soak the corn while you prepare the grill. Once the grill is hot, cook the corn for 20 minutes, turning (with long-handled tongs) several times to grill all sides. Don't worry if the husks burn; the husks protect the corn. That said, if the husks burn off and reveal the corn, keep turning to avoid burning the kernels. When ready to serve, place the corn ears on a platter. Allow each diner to remove the husk and season the kernels with butter, salt, and freshly ground black pepper.